Cheesecake. I love it and I’ve decided that I don’t make it often enough, I’m not quite sure why. Oh yeah, probably because I would eat the entire thing. Anyone else love cheesecake as much as I do? I love them all! Baked or not baked are both perfectly ok in my world. I don’t discriminate when it comes to cheesecake. 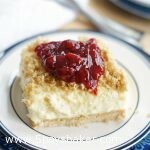 I know there might be some who aren’t fans of the no-bake cheesecakes, but I think this one might convert you. 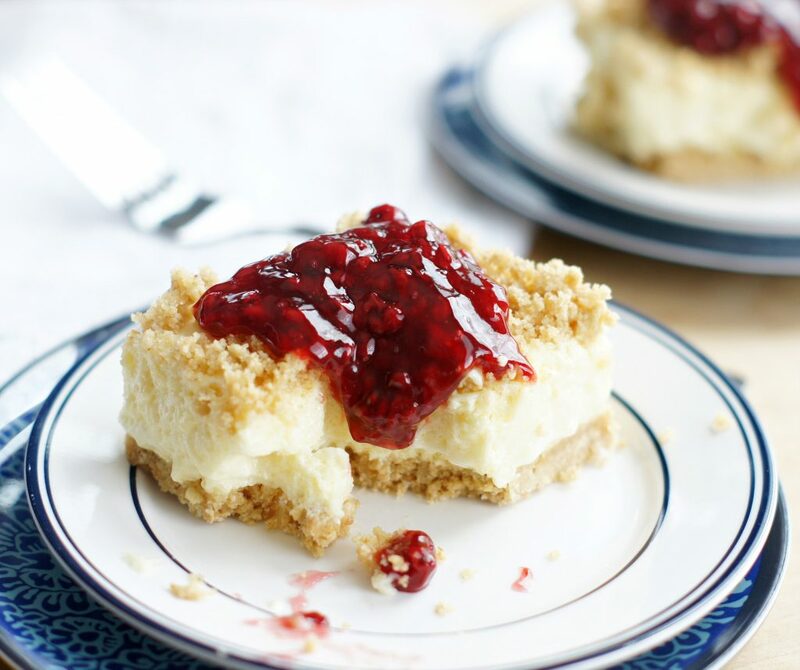 This No-Bake Raspberry Cheesecake was the latest cheesecake to pass by my lips. Holy moly is it delicious! My cute friend Pat brought it to a dinner at my house a couple weeks ago and I immediately fell in love. I made five days later and took it to some friends for dinner. It was a hit. It’s light, refreshing, creamy and light and really so simple to make. You can top it with fresh raspberries rather than raspberry pie filling if you’d like, you’re call . . . you choose. This really is the perfect dessert to end any meal so you should go make it :). 1 cup evaporated milk , whipped until "frothy"
Dissolve Jello in hot water, cool and blend in whipped evaporated milk. Set aside. Beat softened cream cheese, 1 cup sugar and lemon juice together. Mix until smooth. Gently fold the gelatin mixture into the cream cheese mixture. Combine graham cracker crumbs, 1/2 cup sugar and melted butter. Reserve 1 cup of graham cracker crumb mixture and set aside. Place remaining crumbs on bottom of a lightly buttered 9x13 pan and press down. Evenly pour cheesecake mixture on top and sprinkle with remaining crumbs. 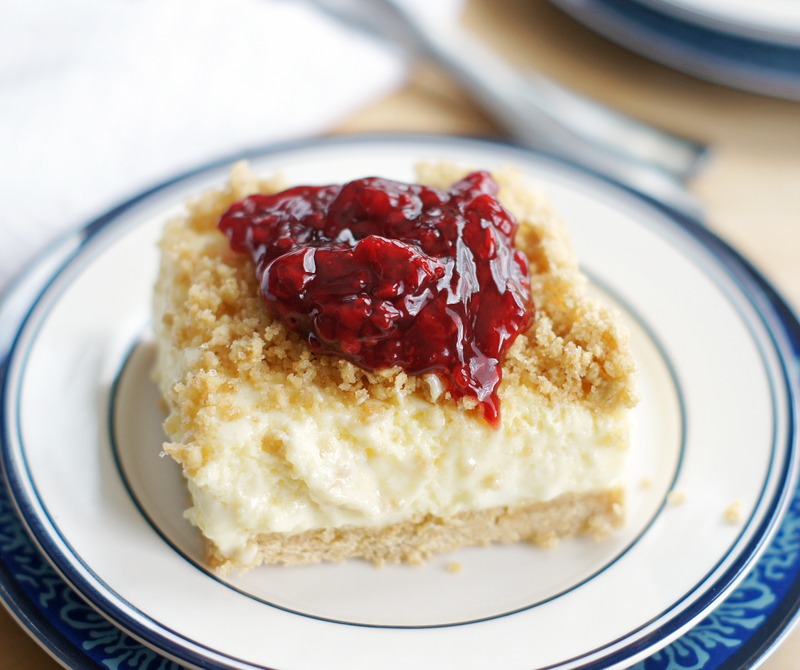 Cut into squares and serve with a spoonful of raspberry pie filling. Jodi, this looks fabulous and I love cheesecake. I am intrigued by the Lion House Christmas cookbook. I have their Classics one, which I love. Do you own the Christmas one? If so, do you like it and cook a lot from it for the holidays? Sounds like maybe a good one to own? Hi Teresa! I do own the Christmas Lion house cookbook. There are two different ones, I put the link for the one I own. I don’t know if the other one is just an updated version of the one I have or if it is totally different. Anyway, I love this cookbook. I have so many cookbooks that I forget about so many of them so it’s fun to pull them out, dust them off and bake from them again. A few of my favorites from it are the taco soup, savory baked chicken breasts, peach ice cream, Christmas Raspberry Crunch (it’s the pretzel jello that you’ve probably made, it’s everywhere. I do leave the pineapple out though), oatmeal fudge bars just to name a few. My friend just made the lasagna out of it and said it was delicious. This looks wonderful! I will have to try it. 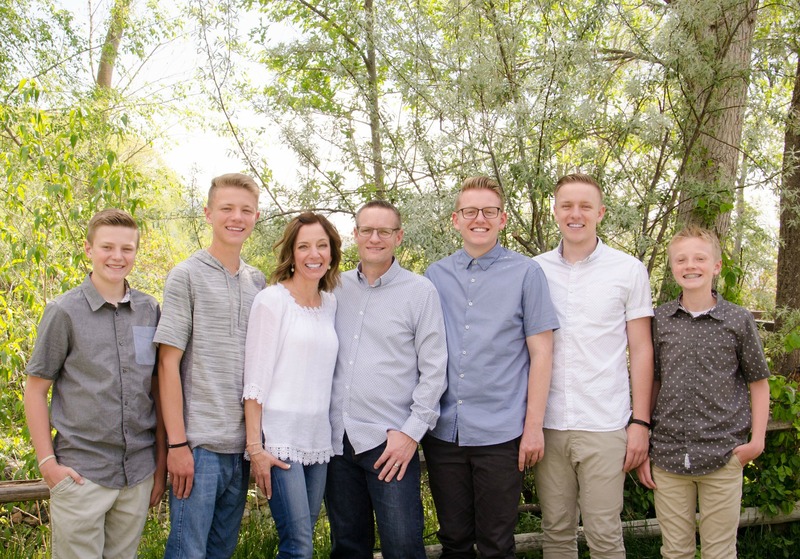 I have five kids, too, but a mix of boys and girls. Fun! I hope you have a chance to make this. Five kids definitely keep you busy! Take care.